On a recent podcast, we argued about what position is the biggest need for our Chicago Bears: wide receiver or edge rusher. While both positions need to be addressed this offseason, the new offensive scheme should mitigate some concerns at receiver, making pass rusher more important. Pernell McPhee and Willie Young are likely to be released, and Leonard Floyd, when healthy, is the only viable pass rusher the Bears have on the roster. With the Bears facing Aaron Rodgers twice a year, they need to be better at getting after the quarterback. Demarcus Lawrence – the top pass rusher in free agency – is expected to be franchise tagged, and the rest of the free agent pass rushers have large question marks. So, the Bears will be better served to upgrade the position through the draft. Let’s take a look at some prospects the Bears might be targeting. If the Bears are lucky enough to have Bradley Chubb fall into their laps, Ryan Pace should sprint to the podium to announce the pick. And while a run on quarterbacks could make this possible, it is still a huge longshot, which will force Chicago to look elsewhere. Luckily, Pace shouldn’t have to look too far down his draft board to find Boston College’s Harold Landry. Listed at 6-foot-three, 250-pounds, Landry was the top pass rusher in the nation in 2016, leading all of college football with 16.5-sacks and seven forced fumbles to go along with 22 tackles-for-loss (fifth in the nation). He was a sure-fire first-round pick, and possible number one overall, but decided to go back to school for his senior season. Unfortunately, he battled an ankle injury all year, missing five games and when he did play, clearly wasn’t fully healthy. Because of this, he only managed 8.5 tackles-for-loss and five sacks. A far cry from his record-setting junior year. Landry won’t overpower anyone with a bull rush, but what he lacks in power he more than makes up for with athleticism. His long limbs and frame make him flexible enough to bend around offensive tackles. A quick get off (a common theme when watching Landry) forces tackles to overcompensate by reaching and bending at their waist. This allows Landry to use his inside arm to chop the offensive lineman’s arm and “bend” around him. His ability to turn the corner off the edge and flatten, all while maintaining top-end speed, is incredible. This is an area where Landry separates himself from the rest of the class – including Chubb. Landry isn’t going to blow you away with pure strength or bench press reps at the combine, but his functional play strength is more than adequate due to his ability to generate leverage. One scouting term you will hear a lot between now and the draft is “convert speed to power”. Landry flashes this ability, although he could be more consistent in this regard. When he gets to the top of the arc from his speed rush, he plants his outside foot and uses his inside arm to get under the tackles shoulder pads in order to gain leverage. From here, he is in total control and is able to walk the tackle back into the quarterback, forcing an incompletion. Landry could be more consistent, but with NFL coaching, he possesses elite potential in this area due to his tremendous arm length. Landry can be a bit of a one-trick pony as a pass rusher. Lucky for him that one trick is the most sought-after trait teams look for in pass rushers: Speed. While this worked well in college, he will need to develop a counter move in order to reach his potential of a top-tier pass rusher. If his initial speed rush does not succeed, he tends to stall out at the apex of his rushing arc. He has had some success with an inside move, but will have to become more consistent on when to use it in the NFL. Subtle technique tweaks could take him from a good pass rusher to a great pass rusher. Then there is the issue of his ankle injury. He will need to prove he is completely healthy at the combine to be in play for the Bears in the first round. If you think Landry can rebound to his 2016 form, then he is well worth the No. 8 pick. 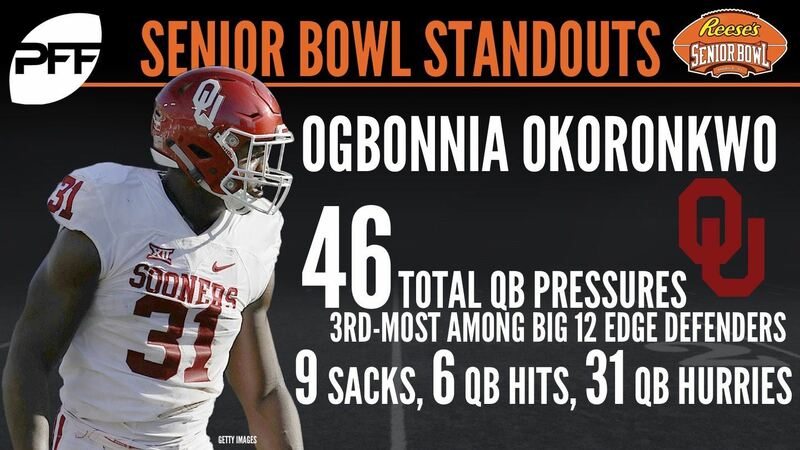 If the Bears go elsewhere in the first, Ogbonnia Okoronkwo from Oklahoma would be a good consolation prize in the second round. Okoronkwo’s technique and sophisticated approach would be a welcomed compliment to Floyd’s speed off the edge. Okoronkwo was the lone bright spot on an otherwise underwhelming Sooners defense. He led the team in both tackles-for-loss (17), sacks (9), and fumbles forced (3) while finishing second in total tackles (75). A strong senior season earned him numerous awards including co-Big 12 Defensive Player of the Year, First Team All-American (Walter Camp) and Big 12 First Team. He was also a semi-finalist for the Bednarik and Butkus Awards. Much like Landry, Okoronkwo has the quick get off and speed to beat offensive tackles around the edge. The clip below is from the Senior Bowl, where he had two sacks against some of the best players in the country. The offensive tackle barely is able to get a hand on Okoronkwo before he can get to the quarterback. His speed and flexibility are only outmatched by Landry in this pass rusher class. 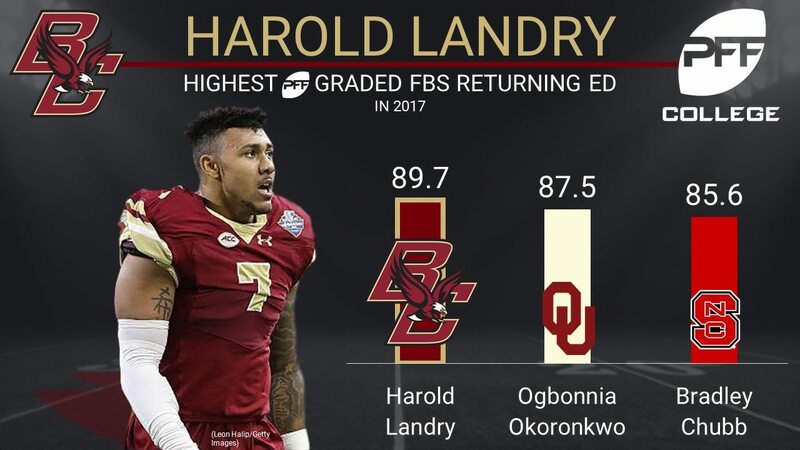 One area where Okoronkwo actually has Landry beat is in his technique. Okoronkwo uses his hands extremely well in order to prevent offensive lineman from getting their hands on him. He combines this with a variety of pass rush moves. This allows him to use his athleticism to win despite his lack of ideal size. He uses his hands to swat away the offensive lineman’s initial punch which allows him to get around the edge. He then uses his elite short area quickness and change of direction skills to avoid the double team by the running back. He doesn’t get the sack but his disruption throws off the timing of the play. Okoronkwo is undersized at 6-foot-one and 240 pounds. Right now he utilizes his quickness to get in the backfield on run plays. This won’t work as consistently at the NFL level and he will need to get stronger at the point of attack, and could limit him to a situational pass rusher (at least in his rookie season) at the next level. Although he may lack prototypical size for the position, his 34.5-inch arms will help him in this regard. In the play above, Okoronkwo created pressure, but doesn’t end up getting the quarterback to the ground. This is a common occurrence for him. So while his technique and athleticism are elite, he needs to work on finishing the play. While this may seem nit-picky, it happened often enough for NFL teams to take notice. As it stands right now before free agency, I can’t see the Bears waiting until the fourth round to address the position. However, it’s possible for Pace to double-dip by drafting two edge players. After all, you can never have too many pass rushers. If this is the case, Duke Ejiofor in the fourth round would be a great pickup. 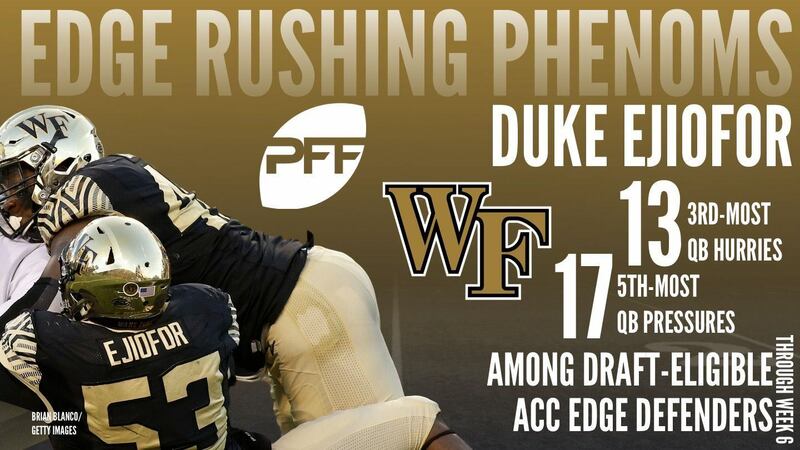 Ejiofor has been a force for Wake Forest the last two seasons racking up 34 tackles-for-loss and 17.5 sacks. Ejiofor has the talent to be a second-round pick. However, a shoulder surgery will prevent him from working out at the combine and at his pro day which will most likely move him down draft boards. For a player with questionable athleticism, a good combine could have laid to rest some concerns. But now it looks like a team looking for pass rush help could get a steal in the mid rounds. Ejiofor is much bigger than the other two players mentioned (6-foot-four / 275-pounds) and it shows on tape. While Landry and Okoronkwo win with speed and athleticism, Ejiofor wins by overpowering offensive lineman with brute strength and a nuanced approach. Ejiofor shoots out of his stance with low pad level, increasing leverage and allowing him to convert speed to power to easily push the left tackle out of the way. His strength flashes on film and this combined with his feel for rushing the passer will allow him to be used in a couple of different ways. Specifically, the Bears could choose to use him as an outside linebacker on early downs and then kick him inside as a three-technique defensive tackle in their nickel package. This is a role he filled often for the Demon Deacons to great effect. Ejiofor won’t “wow” you with his explosiveness, but his power, technique and refined approach as a pass rusher make him an intriguing option for the Bears. While he has better play strength than the other two rushers, his upside is limited due to a relative lack of athleticism. He doesn’t have the speed or bend to consistently beat NFL tackles around the edge. I wouldn’t be surprised if teams asked him to put on some weight and move inside permanently. This would limit his impact, especially early on in his career. Ejiofor’s lack of athleticism also will make it difficult for him to drop into coverage which the Bears often ask of their outside linebackers. He is too stiff hipped to turn and run with linebackers and tight ends. Considering Vic Fangio likes his linebackers to be versatile, this could be a deal breaker. However, Ejiofor is too good of a player to completely dismiss. Ejiofor flashes potential but can disappear at times in games. NFL coaching should allow him to more consistently make an impact. 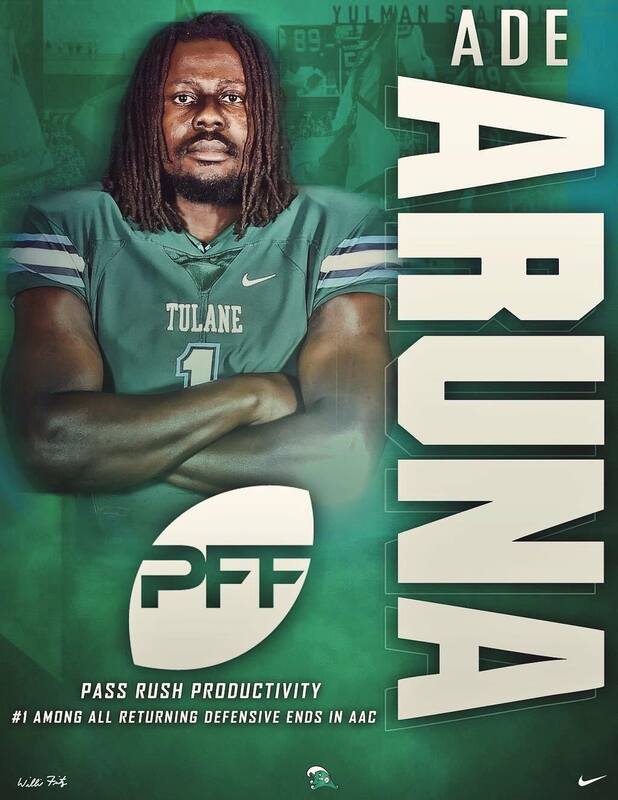 If the Bears are looking for a developmental prospect later in the draft, then they should focus on Ade Aruna from Tulane. The Nigerian-born pass rusher has only played five years of organized football. Despite the limited time, he has shown the necessary traits and frame for which teams covet. At 6-foot-six, 265-pounds with great athleticism, agility and balance, Aruna stands out when you watch his tape. His high motor and relentless pursuit put him around the ball often. But his physical traits have not resulted in much in terms of production so far. He only has 10 sacks in three years as a starter for the Green Wave. He is still “rough around the edges” when it comes to technique which is to be expected for someone so new to the position. As a late-round pick who can be stashed on the practice squad for a year, Aruna provides the type of potential that should interest many teams – including the Bears. Whether you believe pass rusher or wide receiver – perhaps maybe another position – is the Bears’ biggest need this offseason, there is no denying the need for a complimentary player opposite Floyd. To compete in the NFL, teams really need three designated pass rushers capable of putting pressure on the quarterback. This allows everyone around them whether it’s linebackers, safeties, or cornerbacks to do their job more effectively. The players mentioned above are just some of the quality pass rushers the Bears could potentially bring in through the draft. Comment below to let us know how you would like to see address the position this offseason. Oh this was. Wonderful article!! I agree with everything you say!! You are awesome!! To compound the tragedy, I think Aldon was one of the most gifted pass rushers in history. People wrongly give 100% of the credit to the T&E stunts with Justin because when Justin got hurt, Aldon”s sacks went way down. I”m a huge Justin Smith fan, but if it was all Justin, why didn”t Haralson and all other edge rushers next to him break sack records as well? But Aldon badly hurt his shoulder/labrum in that same game vs the Patriots. His hand punch was never the same. He had a weird offseason after that. Rumors about re-injury during boxing training and whether or not his surgery was authorized by the team made me wonder if the injury accelerated the substance abuse.